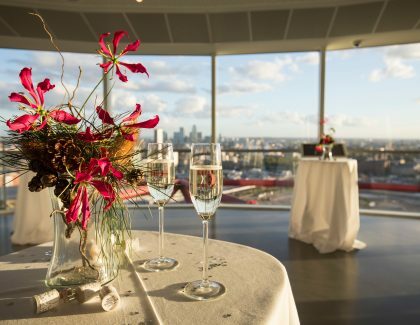 Say ‘I Do’ in the truly unique surroundings of the ArcelorMittal Orbit, licensed for civil wedding ceremonies and civil partnerships, providing the ideal space for both your ceremony and reception. 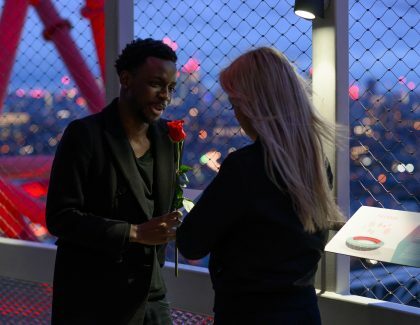 Say your vows at 250ft at the lower viewing platform, before moving to the upper viewing platform at 262 feet to experience a spectacular wedding breakfast, all set against the stunning panorama of London’s stunning skyline! The external walkway is the perfect place for an alfresco drinks reception and sunset photos before you watch the sun set behind the city and party the night away in a truly unique setting. For a more unusual start to married life, adrenaline seeking couples can also hire The Slide, the world’s longest and tallest tunnel slide. Thrill your guests with a 40 second descent through 12 twists and turns at speeds of up to 15mph! We have created a range of seasonal menus and drinks lists to suit everybody, with each of our wedding packages including a 3 course fine dining menu. We can also cater to a range of dietary requirements and requests, including Asian specialties, Kosher and Halal. To find out more, discuss your requirements and arrange a time to view the venue please contact us, or call 020 8221 9114. Our dedicated events team look forward to helping you plan your special day. Did you know you can privately hire the ArcelorMittal Orbit and The Slide for events? Find out more about our exclusive proposal packages.